NEW YORK–(BUSINESS WIRE)–Parents in the U.S. now spend $500 billion annually on their 18- to 34-year-old adult children – twice the amount they contribute each year to their retirement accounts ($250 billion)1, according to a new Merrill Lynch study conducted in partnership with Age Wave. The study also found that nearly two-thirds of parents report having sacrificed their own financial security for the sake of their children. Even with the financial challenges and sacrifices, over 90 percent of parents say that parenting is the most rewarding aspect of their lives. There are 173 million parents in the United States today, 76 million with children under 18.2 While 89 percent agree there is “no normal” when it comes to parenting, there are common patterns as the journey unfolds. “The Financial Journey of Modern Parenting: Joy, Complexity and Sacrifice” takes an in-depth look at the financial and emotional journey of contemporary parenting. This study marks the third in a multi-year research series from Merrill Lynch and Age Wave that examines five distinct life stages: early adulthood, parenting, caregiving, widowhood, and end of life/legacy. Parental purpose is raising happy, self-sufficient children. With infants and toddlers, parents say they are primarily nurturers and protectors, and the majority (52 percent) say this is the most rewarding stage of parenting. The most challenging phase is with middle to high school age children, when parents play a variety of roles to help their kids move towards independence, including teacher, cheerleader and ATM. As children become independent adults, parents become advisors and friends, and often financial supporters. Finances increasingly influence when – or if – to have children. Today, 73 percent of people factor finances into their decision to become a parent. In contrast, in the 1980s, only one-third of people took finances into consideration when starting a family. The costs of parenting are surprising and steep. The average cost of raising a child to age 18 is now estimated to be over $230,000.3 Nine in 10 parents are surprised by how much money they spent after becoming a parent, and nearly two-thirds report encountering financial difficulties associated with parenting. Traditional female/male parenting roles still predominate. Even in this era of increasing gender equality, women take 10 times as much temporary leave from work as men take upon the arrival of a child.4 This can result in lasting financial ramifications for women due to loss of income and benefits, missed raises/promotions, and lost opportunities to fund their 401(k) and Social Security, as underscored in the recent Merrill Lynch and Age Wave study, Women and Financial Wellness: Beyond the Bottom Line. On the other hand, upon becoming a parent, men are more than twice as likely as women to switch to higher-paying jobs with better benefits, work longer hours, or take on a second job to bring in more money. Beyond boomerang: the hidden economy of ongoing support for adult children. Seventy-nine percent of parents of early adults now provide them some type of financial support. 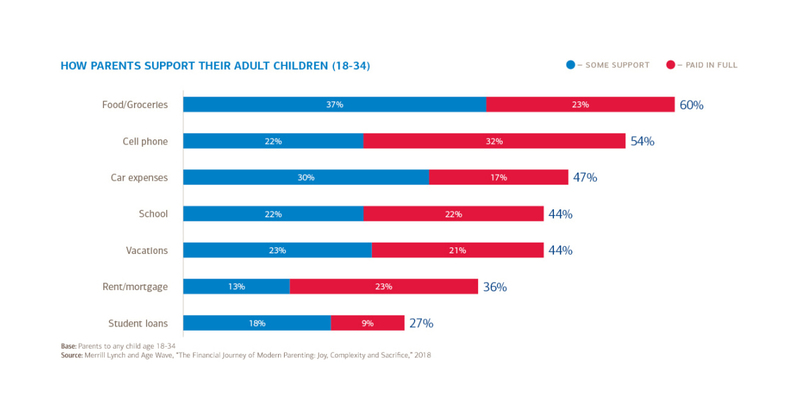 Thirty-one percent of early adults ages 18-34 live with their parents, more than the percentage who currently live with a spouse.5 However, even if their child is living independently, today’s parents often contribute to school costs, health insurance, rent, and car expenses – and even food, groceries and cell phone service. (See Figure below for details). In addition, 59 percent expect to help pay for their children’s weddings, 26 percent expect to contribute to their children’s first homes, and one-third plan to contribute to their grandchildren’s college costs. Parents need – and want – help with financial parenting. The study revealed a significant disconnect between what parents think they are teaching their children and what teenage children report learning. For example, while 59 percent of parents believe they taught their children the benefits of investing, only 31 percent of teenagers reported having learned about it from their parents. Nearly three-fourths of parents wish they had help teaching their children about investing, and 90 percent of parents say they’d like personal finances to be taught to children in school. The family bank may be overdrawn. Seventy-two percent of parents say they have put their children’s interests ahead of their own need to save for retirement, and 82 percent say they would be willing to make a major financial sacrifice for adult children, including drawing down savings (50 percent) or curtailing their lifestyles (43 percent). One-fourth would take on debt or pull money from retirement accounts. 1 Calculation based on parents’ contributions as reported by their adult children ages 18-34 across 14 expense categories and IRS data on employees’ elective contributions to the full range of retirement accounts. Merrill Lynch is a leading provider of comprehensive wealth management and investment services for individuals and businesses globally. With 14,820 financial advisors and $2.3 trillion in client balances as of June 30, 2018, it is among the largest businesses of its kind in the world. Bank of America Corporation, through its subsidiaries, specializes in goals-based wealth management, including planning for retirement, education, legacy, and other life goals through investment, cash and credit management. Within Merrill Lynch, the Private Banking and Investment Group focuses on the unique and personalized needs of wealthy individuals, families and their businesses. These clients are served by approximately 200 highly specialized private wealth advisor teams, along with experts in areas such as investment management, concentrated stock management and intergenerational wealth transfer strategies. Merrill Lynch is part of Bank of America Corporation. For more information, please visit https://www.ml.com/financial-goals-and-priorities.html. Bank of America is one of the world’s leading financial institutions, serving individual consumers, small and middle-market businesses and large corporations with a full range of banking, investing, asset management and other financial and risk management products and services. The company provides unmatched convenience in the United States, serving approximately 67 million consumer and small business clients with approximately 4,400 retail financial centers, including more than 1,700 lending centers, more than 1,900 Merrill Edge investment centers and more than 1,300 business centers; approximately 16,100 ATMs; and award-winning digital banking with more than 36 million active users, including 25 million mobile users. Bank of America is a global leader in wealth management, corporate and investment banking and trading across a broad range of asset classes, serving corporations, governments, institutions and individuals around the world. Bank of America offers industry-leading support to approximately 3 million small business owners through a suite of innovative, easy-to-use online products and services. The company serves clients through operations across the United States, its territories and more than 35 countries. Bank of America Corporation stock (NYSE: BAC) is listed on the New York Stock Exchange. Bank of America Merrill Lynch is a marketing name for the Retirement Services business of Bank of America Corporation (BofA Corp). Banking activities may be performed by wholly owned banking affiliates of BofA Corp, including Bank of America, N.A. (BANA), member FDIC. Certain associates are registered representatives with Merrill Lynch, Pierce, Fenner & Smith Incorporated (MLPF&S) – a registered broker-dealer, member SIPC, and wholly owned subsidiary of BofA Corp.